you’re invited to our pirate party with pirates of the karaoke! 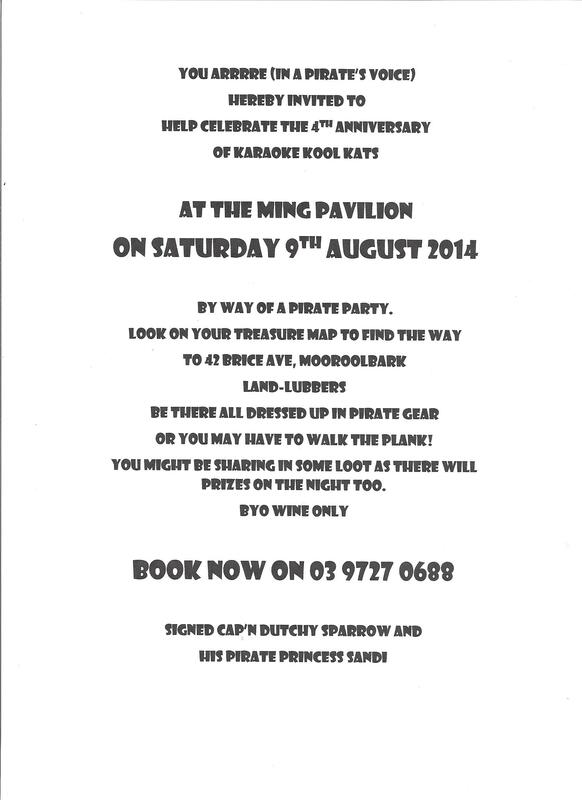 To help celebrate the fourth anniversary of Karaoke Kool Kats, we shall be having a dress-up night at the Ming on Saturday, 9th August 2014. Come along and join in the fun, and remember to like us on our facebook page called Sing at the Ming. This entry was posted in karaoke, sing at the ming with sandi and dutchy, theme night and tagged eastern suburbs karaoke saturday, karaoke party night August 9 2014, pirate party dress-up, pirate party invitation, sing at the ming with sandi and dutchy. Bookmark the permalink.